Want to zip through your kitchen in record time? How about making it easier for everyone to help themselves to healthy snacks? Take Back Control of Your Kitchen! How about getting all your counter space back? Here’s how to get the chaos under control for smoother mornings and nights. The kitchen is Grand Central Station for most families. Let’s get it under control and organized! Using just a few inexpensive items, serenity will return. Well, at least it has a better chance! See if these easy projects could make your kitchen more user friendly. 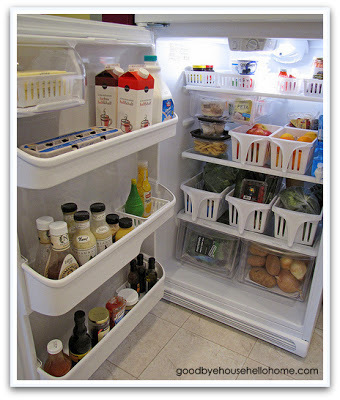 Pull-out containers use all the space in your fridge–all the way to the back. You can organize what you put in the containers or just use them for efficiency. Label a snack bin and fill it with healthy choices. Hopefully they won’t grab items you plan to use in a recipe or meal that way. Put lunches in a special bin in the fridge to make mornings easier too. Use Every Bit of Space! You might like to use some larger plastic containers in the fridge for some shelves. The main thing is getting those spots in the back of a shelf to be more reachable. No more wasted space and hopefully no more wasted food when you can see what’s in there! If you use only plastic containers with no holes, you have a much easier time cleaning the fridge. Just pull out the container, wash and dry, and put it back. No more messy shelves to clean! Why not put the backs of cabinet doors to work? Close them and everything disappears! 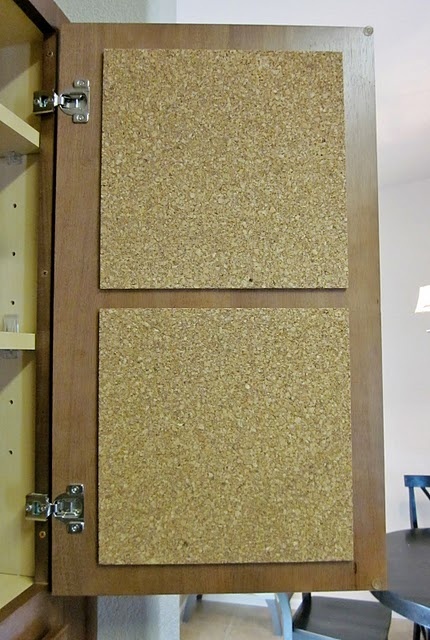 Put self-stick cork tiles on the back of some cabinet doors for out-of-sight paperwork. One of the best reasons to do this is that you get your counter space back. No more clutter from various things saved to put away later. Think of all the space you’ll gain for fixing food! Making dinner just got much easier. You can set aside one for each person in your family as a place where they can find notes to them from you. Teach the kids to “check their door” right away when they get home from school. You could include their chore chart there also. You can use these areas in many ways. Designate one for the week’s schedule of activities, another for the week’s menus, another for notes from school, etc. You can put up a recipe that you are going to use and even cook from it while it’s still on the cork board. You can make one hold receipts, coupons, phone numbers, whatever usually collects around the kitchen counters. Be sure to clear these bulletin boards as needed. Going through them on the weekend keeps things tidy and up to date. Also use enough pins to keep the papers from flying every time you open the doors. How many drawers can you empty? 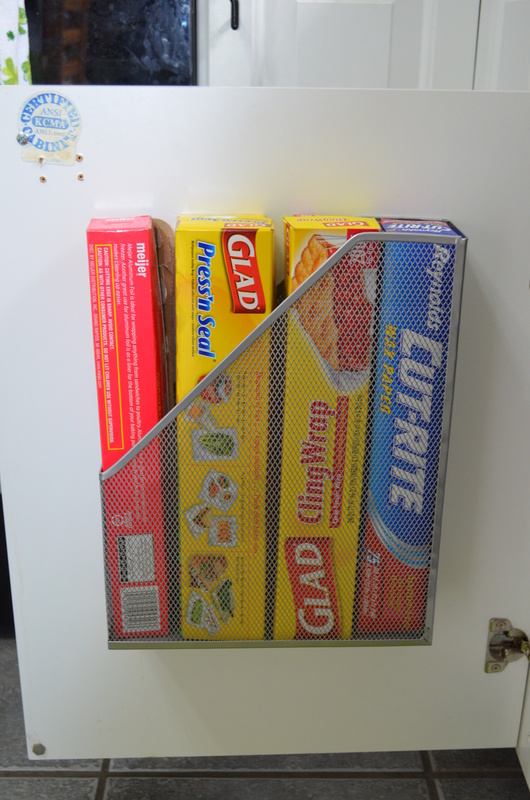 Attach self-stick hooks to the back of a cabinet door to hold potholders. Just put them on the back of a cabinet door near the stove. One more drawer to empty: attach a magazine holder to the back of a lower cabinet door to hold boxes of foil, plastic wrap, waxed paper, etc. If you get the right kind, it can hold small cutting boards. You might get enough drawer space to dedicate one to pencils, scissors, tape, glue, stapler, markers, crayons, etc. that the kids need for school work. No more searching the house for school supplies. A bill drawer makes a lot of sense. It doesn’t have to be in the kitchen, but it’s convenient to have one in the kitchen. When the bills come into the house they go directly into the bill drawer until it’s time to pay them. No more lost bills! Looking for more ways to find storage space in a kitchen? 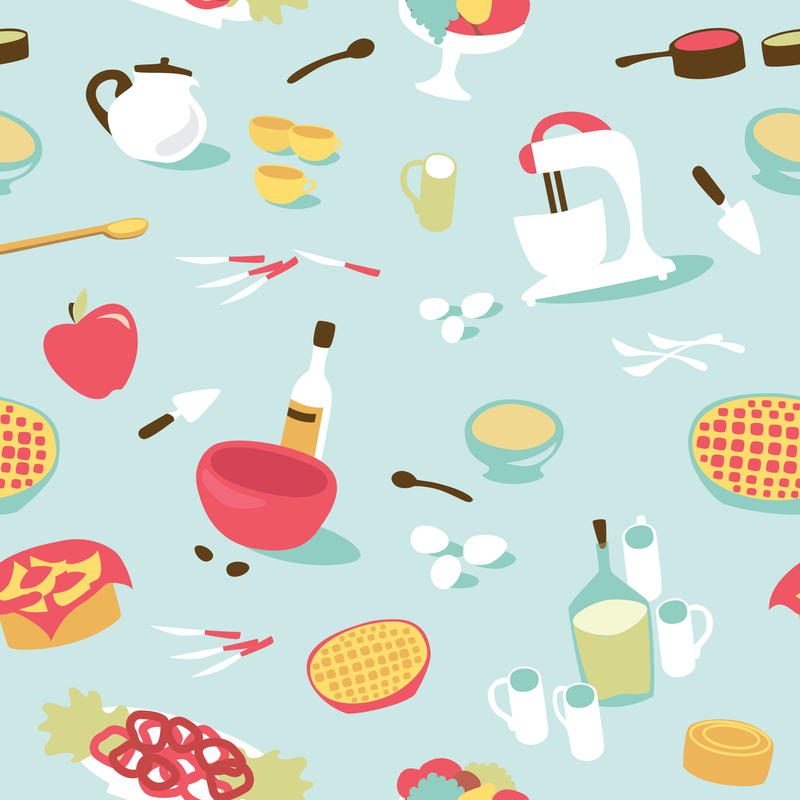 Check out 10 Ways to Organize a Small Kitchen. How do you keep your kitchen functioning smoothly? How do you keep the kids organized? Please share your tips in the comments section!